Down in bayou, a Cajun man named Jess Harley sneaks into the hut of the local witch, named Mary Bones. Harley wants to steal something valuable enough from the old woman that he’ll be able to sell it and escape his life of poverty in the swamps. Jess quickly discovers a large crystal ball, which he takes to New York City in hopes of finding his fortune. While walking the streets of the metropolis, Jess gets distracted by all the sights and bumps into a stranger… who happens to be one of the TMNT in disguise. The force of the collision causes Harley to drop the crystal ball, and it rolls down a drain and falls into the sewers! Jess finds access to the underground sewage system via the subway, and as Fate would have it, he quickly recovers the crystal… but no sooner does he pick up the treasure when he is interrupted by Mary Bones herself! Harley falls to his knees in fright as the old witch explains that what he has stolen is no mere gem, but a powerful magical item capable of transmogrification. Mary Bones then uses the crystal’s powers to change Jess Harley into a mutated aligator man… a Leatherhead! Leatherhead chases after the witch, but she vanishes into thin air. The mutant gator then crashes through a wall and falls through several layers of brittle sewer flooring and winds up on a table in Shredder’s hide-out. Shredder lies to Jess and tells him that the TMNT and Mary Bones are working together for evil purpose and that they hold the key to how Harley can be returned to human form. Completely fooled, Leatherhead agrees to help Shredder capture the Turtles! 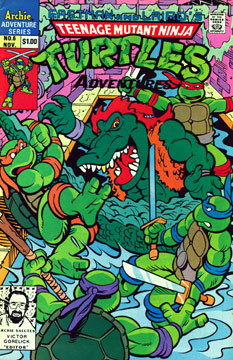 Eventually the TMNT end up fighting Bebop, Rocksteady and Leatherhead on a bridge located in the sewers. Leatherhead, confused by conflicting stories from Shredder and the Turtles, throws a fit. The frustrated gator man thumps his massive tail onto the aged structure, causing a huge section of it to collapse… taking Leatherhead with it!